ELMONT, NY—After weeks of trading insults and mounting animosity between the 3-year-old colts, the weigh-in for the Belmont Stakes erupted into an all-out brawl Saturday as Justify and Bravazo exchanged blows on the stage. 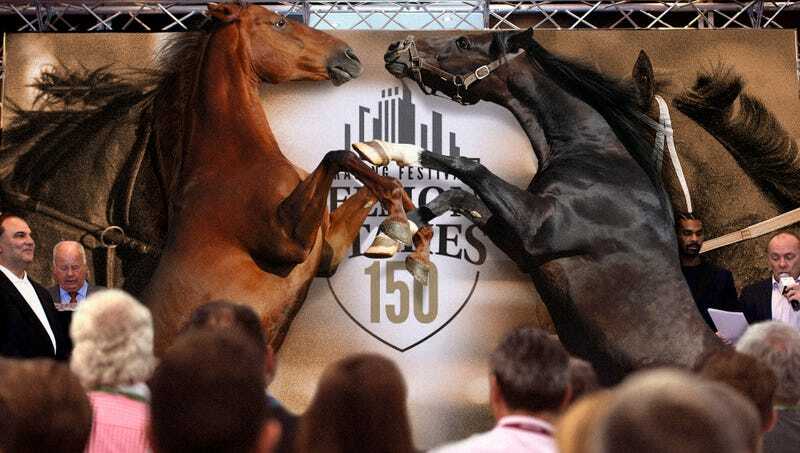 “As soon as they hit the scales, the horses were in each others’ faces snorting, stomping, and bumping their chests, and before we knew it, the hooves were flying,” said Bravazo’s owner Brad Kelley, who ran in with several trainers and security guards to break up the fight as the horses wildly bucked and reared, knocking multiple people off stage. “There’s been bad blood between these two since the Derby when Bravazo spit in Justify’s muzzle and all hell just broke loose. It took 20 men hold them back, but not before a wild hind-leg kick from Bravazo caught a trainer in the chest and broke his sternum.” At press time, many fans criticized the weigh-in skirmishes as increasingly damaging to the reputation of horse racing, especially after the 2016 Preakness melee where four colts broke their legs and had to be shot on stage.